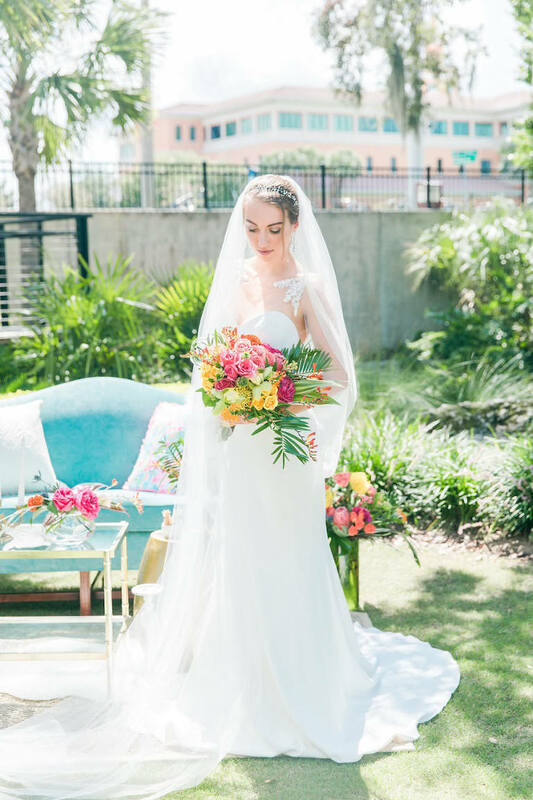 For the bride with her heart set on a vibrant and tropical wedding, there’s no need to grab your passport because you will be swooning over this inspirational Tampa Bay wedding styled shoot. 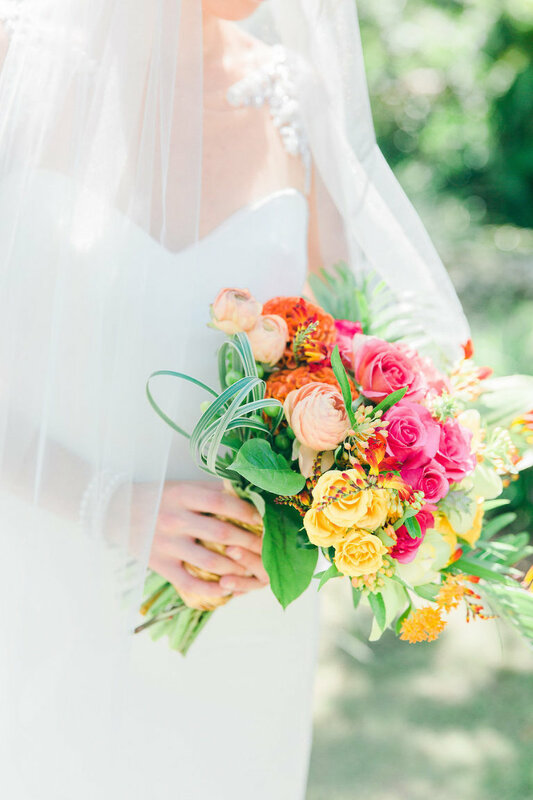 To celebrate spring the iconic bright, tropical colors and prints of the queen of Palm Beach couture, Lilly Pulitzer, we are sharing this to-die-for wedding styled shoot full of elegant details that will make a lasting impression on your guests. To complete the design element of this styled shoot, Tampa Bay vintage wedding rental company owner, Priscilla Henriques of The Reserve Vintage Rentals, brought together an eclectic array of furniture styles to create a unique mixture of seating arrangements accented by white shag rugs and fun throw pillows. 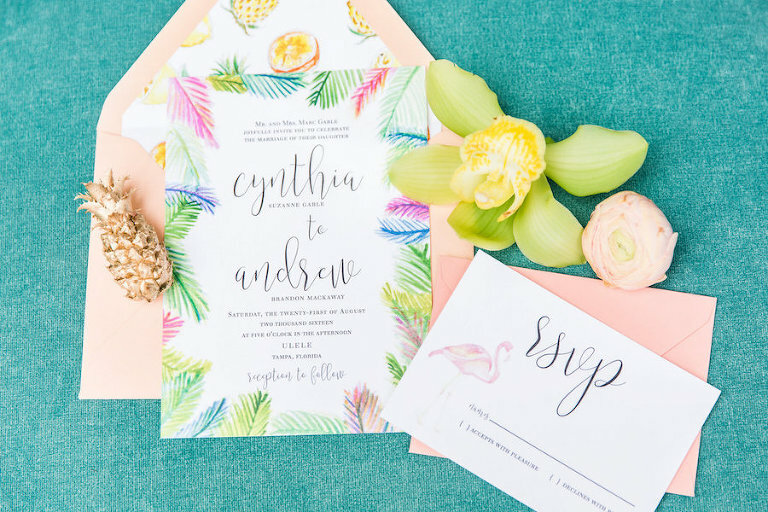 Adding to the tropical theme, local stationery shop A&P Designs created a palm frond wedding invitation suite along with citrus inspired menu and place cards. A party certainly isn’t complete without sweets, and this event had no shortage of delightful and colorful treats. Providing a variety of hand-painted designs to complement the theme was Tampa Bay wedding cake pop dessert artist, Brandi Matiyak of Sweetly Dipped Confections. “I wanted to incorporate a traditional watercolor effect, so I chose to hand-paint a bright pink flower pattern to pay homage to the vibrant colors that reflect Lilly Pulitzer,” Brandi explained. We all loved the feeling and look of Lilly Pulitzer and knew that it was the perfect style to base our colors and theme off of. 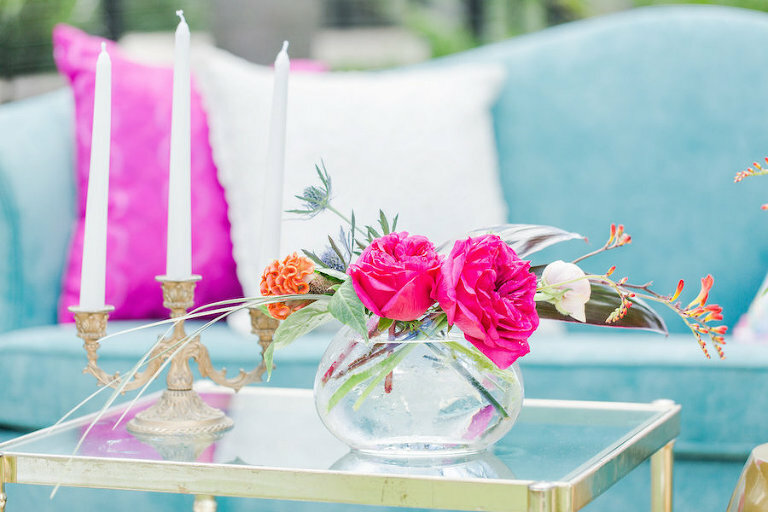 We had a large variety of colors for this shoot, all in very bright and rich tones. 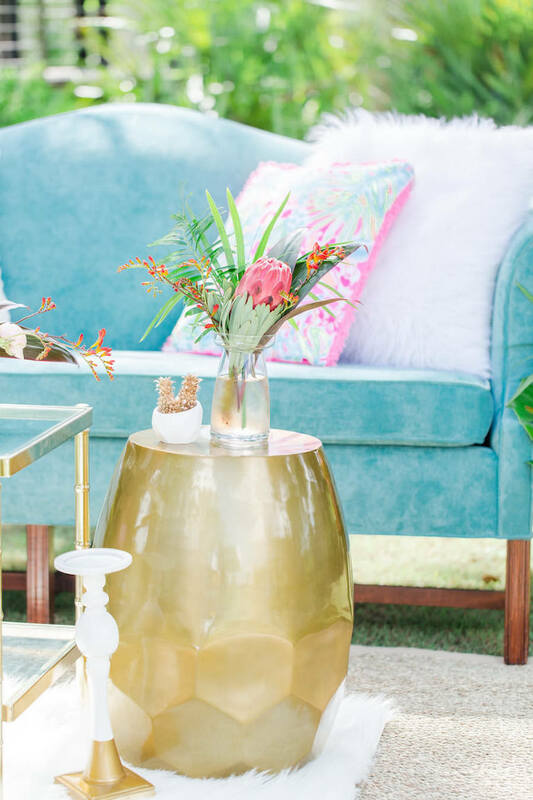 From bright teal chairs, yellow flowers, hot pink desserts, and lots of green palm fronds; the colors made you feel as though you were in a tropical paradise!